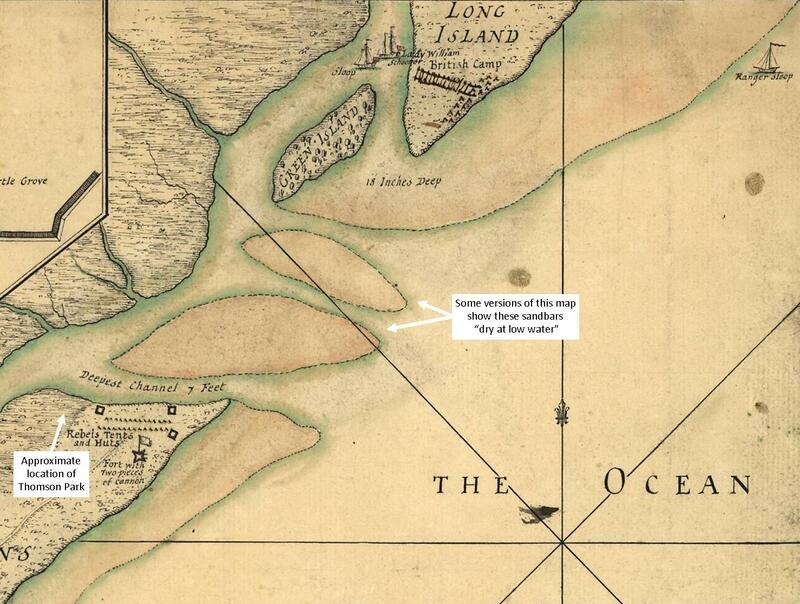 In the middle of June 1776, the 3000 British regulars and loyalists encamped on Long Island saw nothing to stop them from overtaking Sullivan’s Island. They enjoyed a four to one advantage in manpower and firepower. They planned to cross Breach Inlet, overcome any resistance by troops on the Sullivan’s Island shore, then move three miles south and storm the unfinished rear of Fort Sullivan. If the navy’s bombardment proceeded according to plan, the fort would be reduced to rubble by the time they arrived. Events of the next ten days caused a shocking turnaround. After three days of fighting, men on both sides had been killed and wounded and there could be no doubt the patriots had the ability and the will to resist. WISE GUIDANCE AND FAST RESPONSE. On June 21, General Lee sent a scathing letter to Thomson through Moultrie in response to all the skirmish activity. To instill discipline and conserve the patriots’ scarce ammunition, he ordered that no small arms should be fired at targets further than 150 yards and no cannon should be fired at a distance greater than 400 yards. He also wanted Thomson’s two artillery pieces moved away from the inlet to a more secure position some 500 yards south. (8) Thomson rapidly improved the patriot defenses by implementing these instructions from an experienced general who understood artillery tactics. In just two days, a new line of defense spanned Sullivan’s Island and the cannons were in new positions. The patriot cannons were placed beyond the range of British artillery, but close enough to fire on troops and vessels in the inlet. Meanwhile, Generals Cornwallis and Vaughan took a week to get their troops in place on the southern end of Long Island. The British established forward artillery positions closer to Sullivan’s Island, on Green Island and an oyster bank. They fired on the Advanced Guard positions without effect. The oyster bank was close to the patriots, but not within effective range of rifles or muskets. Today, that critical British location is a hummock (small marsh island) known as Clubhouse Point. You can see it just inland of the bridge connecting Sullivan’s Island with Isle of Palms. A skirmish erupted when a small group of patriots paddled canoes into the inlet and became exposed on the British side of a large sandbar, probably near the oyster bank. In an astonishing turnaround, the patriots had seized the initiative. General Clinton was reacting instead of acting. British delays gave Thomson too much time and their indecision let him take control. By June 28, the assembled patriots were no longer raw troops; they were proven in battle. They had benefitted immensely from insights and experience gained during ten exhausting days and nights of combat. They had learned to fire the cannons accurately; they had gained the advantage through strengthened positions; they had gelled into an effective fighting force … and General Clinton knew it. Clicking on the image enlarges it and makes it easier to read. I added British and American troops to the map on the Strategy and Forces pages. The 1776 map doesn’t show much detail, but it’s the best one we have from the period. There are at least three versions with slight differences. The plan is to create a custom map for a wayside exhibit at the park. It will be based on available maps and information from other sources. We’ll add that map to this site when it is developed.